The original version of this post used the term School Choice instead of Catchy Slogans and Phrases, but that seemed to imply I was picking on the Dearest Policy Desires of our new federal Secretary of Ed. So I broadened the title to make the same point. I may be able to read the School Choice layout and her AFC reports and see the plans of both Uncle Karl and what is called the systems view of education at play, but hopefully she does not. Like many people Mrs DeVos may falsely believe that her personal intentions and understandings of terms guide what they really mean and how they work in practice. That’s a dangerous belief that those surrounding her will likely encourage so let me explain why I recognize this as the Systems View of Education. While I am at it, let me lay out a few more Catchy and Melodious slogans that are widely repeated AND headed in a different direction with a specific aim whatever the personal intentions of the advocates–Personalized Learning, Excellence, Reaching a Child’s Full Potential, and Quality Learning are a start. One more clarification as well on what I mean when I write about targeting a person’s decision-making capacity. Another transformationalist put the importance of understanding subjective experience quite well in his book Global Mind Change. Willis Harman wrote that education and “science should now accommodate consciousness as a causal reality.” So crucial a point to target that Harman even italicized it just like that. See how Making Man Moral and Accountability fit right in with these transformational plans unless that aim for education is well disclosed and not shrouded in catchy phrases about Classical Learning, Character, or Virtuous Living? If anyone is tired of me bringing up Uncle Karl like this was a pinball game and I get 50 points for each mention, let’s listen again to what Boulding said was the purpose of what he and all the others I have now tagged to this post called General Systems Theory. I think that statement should have the Slogan “New and Improved” attached to Systems Science covers the relationships among all these education phrases we believe have just an innocuous, common-sense meaning. Following up on the implications of my last post’s citing of both the Right and Left public policy think tanks and academics embracing Boulding pulled up a relevant paper written by Bela Banathy from the early 90s called “Systems Inquiry and its Application to Education.” The paper was “dedicated to the memory of my dear friend and colleague, Kenneth Boulding, one of the founders of the systems movement and the first president of the Society for General Systems Research.” As an aside, SGSR (created at Stanford) merged into ISSS–International Systems Science Society, so all this ties now too to the Laszlos, GELP, the MIT/Skolkovo 2030/2035 Project, and so much more. I have encountered this before where what we call reason and logic or the Axemaker Mind is regarded as in the way of revolutionary social change. John Dryzek called for something very similar–communicative rationality–to accommodate the defeat of ‘capitalism’ in favor of a more economically just society he called democracy back in 1996. Last week, the Cooney Center (funded by Sesame Street revenue), the Frameworks Institute, and the New America Foundation released “STEM Starts early” that called for much the same if we read the small print, or in this case, Appendix B. It called for a “two-science approach” because “policies are the product of politics, and politics is the product of culture.” I could add that culture is an aggregate of what gets shifted when education becomes about targeting individual consciousness and what guides it, but let’s get back to quoting. With only Generalized Ears and carefully instilled guiding Core Values, Ideas, and Perspectives we can all grasp that few students will be in a position to appreciate what actually cannot be as we are all encouraged to help design better tomorrows. When I was so concerned about that Roadmap for the Next Administration I uncovered before the election, this is precisely the assumption built into that Roadmap. Bela must be so pleased his and Boulding’s work endures so, even if it is dangerously wrong to be pushing via education. Now Banathy was talking about more than a student and education in that quote on redesigning systems, but both are included in the systems to be purposefully redesigned at the level of what creates purpose, motivates action, and guides perception. That’s what the systems view of education does under whatever catchy slogan it uses in any generation to stay under the radar of public scrutiny. It has been known as Tranzi OBE (covered in my book) and is now more commonly called Competency-Based Education. It is enshrined into the federal Every Student Succeeds Act and how states and localities must redesign education to get its funding. Both Mrs DeVos and President Trump need to accept that reality and decide what kind of a country and polity we will have with this vision of education and the “two-science” approach to managing the public that was funded by American taxpayers via the National Science Foundation. That’s the beauty of systems science under whatever its current name acting as a cloaking device. 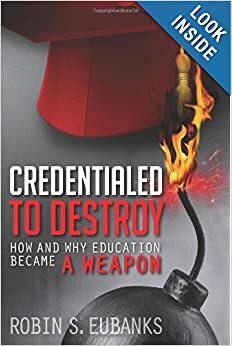 Personal intentions can only become the point again when the elements that make education a ‘system’ designed to control what each student has internalized at a neurobiological level are grasped. Remember noogenetics? We have to understand that control over the decision-making capacity of a student so that their future behavior is now predictable and plannable is what gets touted as Evidence-Based Education grounded in science. That aim is what makes a student assessment “high-quality”. Controlling Learning at this level is what gets a charter renewed and access to federal money to expand into new states. Where’s the Actual choice in any of these visions with this common aim? Systems Science is really ceasing to be a catchy slogan. Best to grasp its essence before it gets yet another new name. Now society is NOT demanding that kind of thinking nor that governments take on that kind of decision-making Overlordship but federal agencies have usefully (to themselves) seized this kind of coercive authority anyway. Either by Executive Order or regulation or overly broad readings of court cases. And now of course the public sector wants Mindsets in citizens amenable to someone having such sovereign power. Over the decisions that history shows are best made by private individuals who have to bear the consequences of lousy decisions. In unlikely to be accidental timing, the Obama Administration in the US and the OECD and UNESCO globally are currently pushing wholesale transformation of K-12 and higher ed. They can thus try to cultivate worldviews that either embrace, or ignore, wholesale changes in governance of society and citizens. So those seeking transformation first need to create beliefs about the nature of the system they want to change and then plant beliefs about why it is unsatisfactory, and then prime for what should be changed. Education has always been useful for this goal but the advent of computer gaming and immersion of students in virtual, deliberately created worlds, takes the possibilities of implanting the desired images to a whole new level. A fact quite apparent here http://www.invisibleserfscollar.com/when-gaming-intends-to-shape-and-distort-our-perceptions-of-everything-around-us-viva-la-revolution/ for reasons that seem to have everything to do with what SRI has always pushed in education (more in a moment). Here’s the crucial point that schemers who want the world to now be guided by social science theories have long known. It’s time we all did too. “the social systems of ants and bees are essentially static in nature and do not exhibit adaptation to the environment beyond what biological mutation can provide. With man, however, comes self-awareness and awareness of a whole system in which the self is embedded. This can produce conscious effort toward a change in the system of the world whether biological, physical, or social. Last week MIT announced a new videogame to teach students empathy http://blogs.kqed.org/mindshift/2013/11/teaching-empathy-through-digital-game-play/ called Quandary. Players “win the most points by accurately predicting each character’s reaction.” Helpfully the game is said to address multiple Common Core standards and be appropriate for grades 3-8. Now since the characters are not real people, the game is also a highly useful technique for fostering false beliefs about people and their values and what drives them. Unlike the real world or even an accurate history textbook, the Quandary characters will be driven by what the game designers want students to believe about the world. Those desires become the guiding images for students during their most pliable, personality formation, years. And in that post I linked above, game designer Jane McGonnigle was quite forthright in the intentions to use games to create images of a desired future and the need for change. Both Jane’s boss, Marina Gorbis (see tag for her) and Willis Harman (discussed in linked post) worked during the 80s at SRI. Now I first became familiar with what used to be known as the Stanford Research Institute when SRI kept coming up as the grant evaluator for university partnerships aggressively pushing constructivist math and science on K-12 in return for multimilliondollar grants from the National Science Foundation. Just imagine how much better I would have understood the dynamic of why aggressive implementation (whatever the outcry or results) brought renewals for a new term if I had better understood SRI as a hive of Humanist Psychology. But better late than never as we evaluate this interview with SRI’s Director of Research in Informal Learning Environments being pushed by the MacArthur Foundation as part of their Reimagining Education digital learning initiative. Maybe Quandary? This is education that assumes a Great Transition is to finally be eminent. Seeking to create the Mindsets to make it so all while misrepresenting to parents, taxpayers, and teachers what is really going on. Lest we all rebel and tell the Malevolent Marshmallow Brain Superintendent or Consultant to quit trying to blow up the society and economy that produces the taxes that overpay them for their willingness to push such nonsense without scrutiny and usually with deceit. That link mentions another April 2010 paper “Naturalizing Assessment” that I managed to secure with some appreciated help. In case you cannot get a copy, it graphically explained the whole point of such reimagining and new theories of learning and the nature of the classroom as being this newsworthy goal–Redefining Learning to Focus on How Well Prepared Individuals Will Be for Adaptive Behavior in New Situations. Now the New Situations are of course the sought Great Transition wholesale social, political, and economic transformations being masked under euphemisms like Martin Luther King’s Beloved Community or Harry Boyte’s cooperative commonwealth or just the term ‘democracy’ as Gar Alperowitz likes to now use. Let’s take a hard look in the next post on the erroneous assumptions in the required classroom implementations to get us to a new “sustainable” public sector centric collectivist society. That no one tells us about unless we start with the Great Transition and trace backwards to the how.